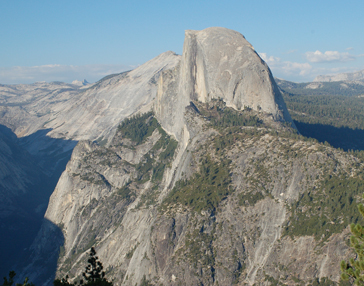 Half Dome Cables Visitor Use Measurement and Modeling | Resource Systems Group, Inc. The hike to the summit of Half Dome is among the most iconic and popular backcountry excursions for visitors to Yosemite National Park. The culmination of the hike involves ascending the last 400 feet of Half Dome via a cable system. 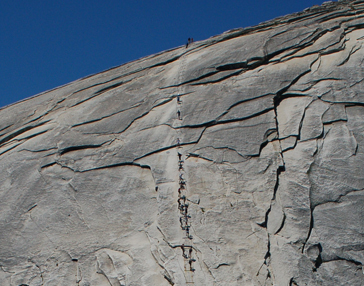 Recent accidents involving fatal falls from the granite dome caused concern about safety on the Half Dome cables. 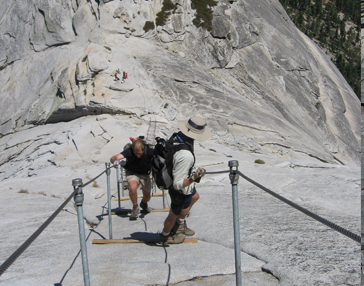 In particular, the NPS was concerned that crowding-related delays on the cables were causing some visitors to become fatigued and/or travel outside the cables where they were exposed to unarrested falls from the granite dome. RSG worked with the NPS to measure and model relationships among visitor use on the Half Dome cables, travel times on the cables, and the number of visitors who travel outside the cables. The resulting statistical and simulation models provided empirical evidence that when there are more than 30 people on the Half Dome cables at one time, visitors experience crowding-related delays and are consequently exposed to a greater risk of an accident. These findings formed a primary basis for the Half Dome Stewardship Plan, which resulted in a permit quota system that is being used to manage visitor use and safety on the Half Dome Cables.